Probably the most popular area for running in Moscow, Gorky Central Park of Leisure and Culture is a wide open space along the Moscow River. 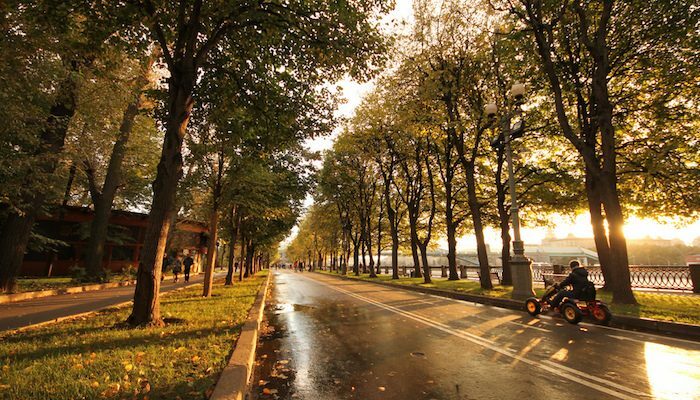 Gorky Park has a bit of everything: a large area dedicated to children, including an amusement park, formal gardens and woodland that combine the former Golitsynskiy and Neskuchniy Gardens, and some fine old buildings dating from the late 18th and early 19th Centuries. It is generally considered one of the safest places to run in Moscow as it is centrally located and away from traffic. There are two good options for running: The path along the river embankment is the best choice for a long scenic run. Start out near the Krimsky Val bridge and run west around the large bend until you reach the Third Ring Road Bridge. Here, you can either double back or cross over the bridge and return on the north side of the river. However, there is generally less traffic on the south side. The other good option, if you want to avoid traffic altogether, is to enjoy a shorter loop around the park’s paths, which can be 2-3 km. Gorky Park also hosts Parkrun, a free group 5k every Saturday. You can see the race course and learn more here.